"Was out to Shell and did some trail work last weekend. The irondoggers have made it to McGrath. Several teams. Lots of IronDog training going on now. Word is that there is very little snow west of Hells Gate. Burn is pretty much bare. I went up to near Finger Lake and did grooming and cutting. Just took some nippers, and a drag. Things are really grooving for human power right now. You hardly make a print in the snow on the trail, it is HARD. So things are looking pretty darn good at this point. That is scary as we all know what the weather can do. But the trail base up to Puntilla and around is good, so that is a good thing." A few days ago Bill, our friend Dan and I rode a frozen river near our cabin. In the summertime this river is a Class III whitewater stream. Only in Alaska I thought can you ride a fast flowing river like this one. You have to pick your time of year when to go on this river and of course you need a snowmachine trail to follow. Just because a snowmachine or severalsnowmachines had been up and down this river doesn't mean it is safe on your bike as well. They move a lot faster even though they are heavier than you on your bike, but we move along much slower. There were several places of overflow that were still wet and still growing that we had to wade through with our Neos overboots. Neos overboots seem to be the choice of boot for many Alaskan winter cyclist. They are warm, waterproof and have gaitors attached in case you step into deep snow. On this river there are sections of trail on a narrow ledge where the river stays open due to the fast current and you ride next to gushing cold water. In other places you have to detour around sections that have caved in since the last snowmachine rode over it. During the course of the winter the water on rivers drops from underneath the ice and creates hollows under the ice and sometimes parts of the ice cave in. In one place the route used by snowmachines didn't look good and we saw an ice bridge that a small fox had used. We followed it and it turned out it was a good route. But we all thought light and it turned out the ice bridge was solid. In other places the water keeps splashing up against the ice and forms ice chandelliers, they are really pretty. In some places the river canyon is narrow and there are beautiful ice falls. In many ways these river rides keep you on your toes, you are constantly trying to pick a safe route, watching splashing cold water run right alongside of your trail and watch fascinating ice formations and animal tracks. That day we saw fox, river otter, wolf and moose tracks. "Friday a friend of mine and I broke trail on our Snowmacines up to where the Irondoggers had been stopped about 1.5 miles short of Finger Lake. We cut some brush and pushed the trail through, then went on to Finger Lake and beyond a ways. Later on Friday Brad Helwig and Eric Qualm (IronDog Team) got part way down the steps to the Happy from where we left it. Yesterday (Jan 2, 2010) Brad and Eric finished the steps, and got a trail on up all the way to Rainy Pass Lodge on Puntilla Lake. There was some rain a week or so ago, and it has really set up the snow good. There still is a lot of alders, but a big snow will really help. 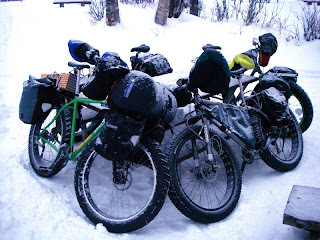 I expect the trail will stay in fine as there are Iron Dog teams, including Eric and Brad that will keep pushing up to Puntilla and beyond in the six weeks left before that start. This is early for a trail in to Puntilla, so that is a good sign. There is quite a bit of overflow out there tough. Anne Ver Hoef (my wife) ran from our cabin at Shell Lake to Skwentna on Friday (this trail is the best anyone has ever seen due to the work by the Shell Lake trail grooming committee), and hardly left a tennis shoe print in the trail with no real overflow problems. On Saturday, she was running up to Finger, and postholed through our snowmachine trail and soaked her feet in overflow, and ended up turning around and coming back to Shell Lake as it was -10F. Most of the lakes around there have overflow lurking. But the trails are really set well with a base, biking or running is no problem out there now. More snow will come, but the trails have a great base right now." I enjoyed Mike Curiak's video presentation of his trip to McGrath. Bill and I just returned from our training camp at Flathorn Lake on the Iditarod Trail. The trail from Point McKenzie to the Susitna River and on up the Yentna River were as good as it gets! We had three great folks that had signed up for our December camp. We started out on December 27 with temperatures near 30 degrees and finished up with 0 degrees the last night under the full blue moon when our students went to the end of Flathorn Lake to spend their last night out and away from our heated cabin. It was a great time riding the trails all the way up to the Yentna River and testing gear, changing tires and more. I feel that everyone learned a lot and I am confident sending them out on the race trail. All three of them are signed up for the Arrowhead 135 in Minesota Feb. 1 as a prelude to their winter racing.